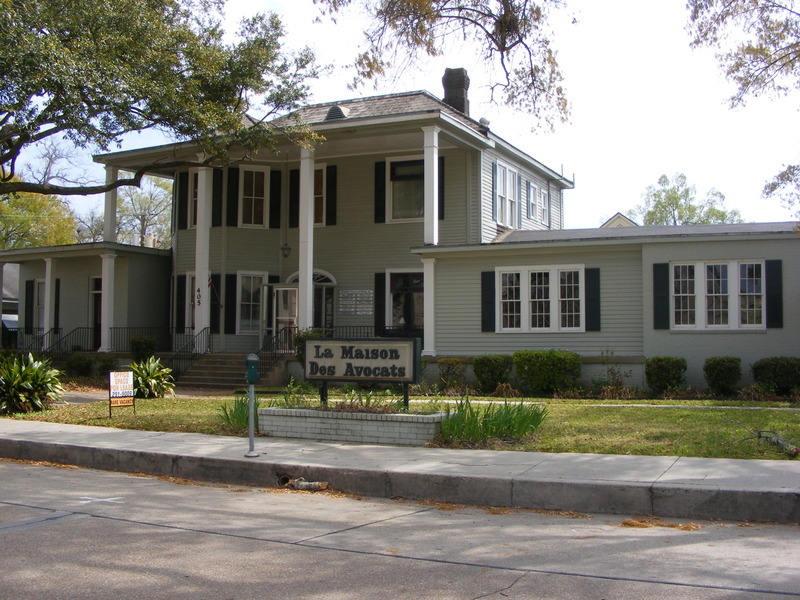 Once called the “Cadillac” area, the white building built in 1901on Lots 20 and 21 of the Old Corporation is now known as “La Maison des Avocats.” The original house was designed by architect George Knapp, who designed many of downtown Lafayette’s buildings in this period, and was the property of Jules Revillon who owned a general merchandise store across the street at the corner of Washington and West Main. Revillon, it is said, once known Napoleon Bonaparte was short in stature. He and his family came to Lafayette from Rouen, France in 1887. He gave the property to his daughter Julie when she married Paul Krauss who was from Alsace Lorraine, a region on the border of France and Germany. 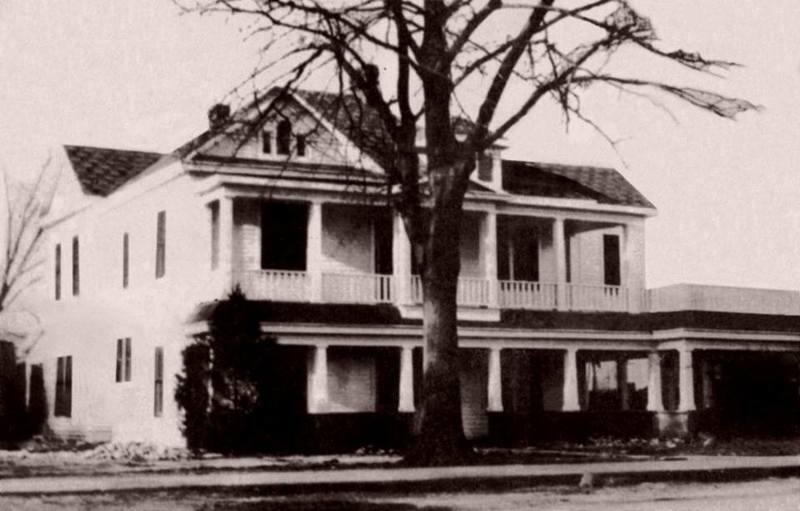 The heirs of this union sold the property for commercial use in 1936. As a young man, Paul Krauss went to watch making school in Switzerland and then worked at Longines Watch Company. Following the defeat of France in the Franco-Prussian War of 1870, Paul Krauss quit his German occupied home in Alsace-Lorraine and left for America hoping to work his way to Asia as a watch maker. Upon arriving in New York, he discovered that his trunk was sent to New Orleans, set out for the Crescent City and when Krauss arrived in that city to recover his belongings, he heard there was a need for a watch repairman in Lafayette. Krauss got the job in Lafayette and set up his work bench close to the window at the Grado Building. When the young watch repairman was noticed by Julie Revillon, she rushed home and damaged her mother’s clock in order to secure a meeting with Paul. He became a frequent visitor to the Revillon’s house and in 1901, the watch repairman married the general store owner’s daughter. The couple had five sons. Krauss opened a jewelry store on Main Street, which moved to 434 Jefferson (today Greenwood Shoes) in 1920. Krauss was probably the first owner of an automobile in Lafayette. 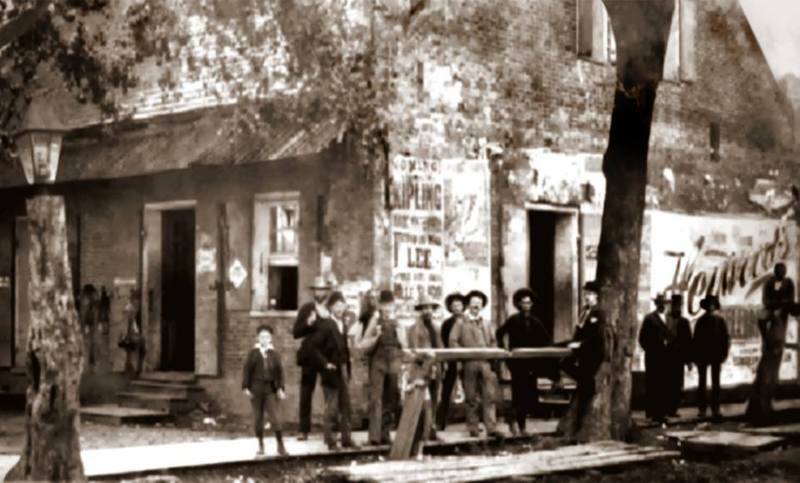 At that time, this part of town was known as the “Cadillac” area.